The first (and POET’s only) ethanol plant in Michigan may differ somewhat from its peers, but it’s making a big difference in the state’s economically stressed “Thumb” region. Mention “Michigan” to most people, and they’re more likely to conjure up images of automobiles, Great Lakes, lighthouses or golf courses than corn fields. Truth is, however, Michigan is officially in the Corn Belt – but not by much. So why then, of all places, did POET choose to build the first ethanol plant in the state here? POET Biorefining – Caro began grinding corn to annually produce a nameplate capacity of 45 million gallons (now 54 million gallons) of ethanol in November of 2002. Its circumstances may be somewhat outside the norm for other POET plants in somewhat less picturesque, but more agronomically gifted states. But the Caro facility has nevertheless distinguished itself as a unique and valued member of the POET family, while providing economic benefit to an area seriously impacted by a slumping auto industry. The “Thumb” refers to that part of east-central Lower Michigan that resembles the thumb on one’s right hand when viewing it from the palm side. The Thumb is bounded by Port Huron at its southernmost point, by Lake Huron on the east and is separated from the rest of the “hand” by Saginaw Bay. Whatever one calls the region, there’s a consensus that it’s darn good farm land. At the same time POET was looking into the potential of the area as the possible site for the company’s fourteenth biorefinery, another group was thinking along the same lines, but from a different perspective. At some point during those three years, members of the group heard a presentation from Jeff Broin and the two groups quickly discovered they shared common goals and ideas. “Their process paralleled ours, and we ended up coming together,” says Morse. But that’s not to say that everything went smoothly from that point on. When an ethanol plant is contemplating coming to a state or area for the first time, people can sometimes be apprehensive. nitially another location had been identified, but ran into stiff resistance from some who were wary of the new plant. However, POET soon found another community that saw things differently. A look at the map of POET biorefineries quickly reveals the obvious – the Caro plant is easily the most remote of the company’s 27 biorefineries compared to its sister facilities, which tend to be built somewhat in clusters within their respective states. The Caro facility has been aggressive with tech improvements, adding BPX™ (fermentation without cooking) in 2005, Total Water Recovery™ (eliminates all water discharge from the plant) in 2009, and is currently in the process of adding a number of upgrades, one of which will make Caro the first POET plant to add “Waste Heat Recovery.” When completed, this addition will capture heat coming off the dryers and thermal oxidizer, and reuse it for plant operations for an annual savings of up to $1 million per year. The upgrade will also include additional water recovery. Other upgrades in efficiency include a complete upgrade of the computerized control system for the plant, a new system called a “double effect evaporator” to further increase efficiency, and beautifying the exterior grounds of the plant. These efficiencies, plus an extremely stable and capable work force, and market advantages resulting from its location, makes Caro a successful facility. It is also one of POET’s safest, having gone six years without a lost-time accident, and is a perennial and respected favorite of state legislators wanting to tour one of Michigan’s five ethanol plants. Now in its eighth year, POET Biorefining – Caro has not only met, but exceeded the expectations key players had for it in the early going. McLoskey added that partly as a result of POET coming to Caro, additional businesses have been attracted to Caro’s industrial park, and the local airport authority has been able to make needed improvements to the Tuscola Area Airport. In addition to the economic benefits, POET Biorefining – Caro strives to be a good neighbor in the community, participating in a host of civic and community organizations and supporting local organizations like the Caro Fire Department and events like the Pumpkin Festival. For his part, Board Member Morse isn’t surprised at the results, economic or otherwise. When POET Biorefining – Caro General Manager Dave Gloer came on board three years ago he knew nothing about ethanol, but one thing he definitely did know – he was ready to do something different. A big part of Gloer’s satisfaction with having made the switch is the work atmosphere at his new job. That’s not the whole satisfaction picture, howevera. Tim Klinesmith was an original hire when POET Biorefining – Caro started making ethanol in 2002, and as an operator, sees the process through from start to finish. Klinesmith states that his work is enjoyable, but also challenging. He adds that the job’s not for everyone, and sometimes can involve considerable pressure. “Operators really need to be people who aren’t bothered much by the pressure,” he smiles. Klinesmith also believes intensely in what he does for a living. Since the beginning, POET has worked hard at being a good neighbor in the Caro community. One organization the plant’s staff has developed a close relationship with is the Caro Fire Department. “They co-sponsor our annual golf tourney, which helps a lot with our fundraising,” says David Mattlin, Caro Fire Chief. One result of the golf outing has been to enable the department to purchase items like “Jaws of Life,” which otherwise wouldn’t have been possible. POET and the fire department also work closely on emergency training. At least twice each year they collaborate on training which is beneficial to both parties. A specialized form of that preparation is “confined space training,” which prepares staff from each organization to respond to crises like rescuing farmers trapped in a grain bin. Don Morse, from Birch Run, Michigan, farms about 2,000 acres, including raising corn, soybeans, sugar beets, and seed corn. 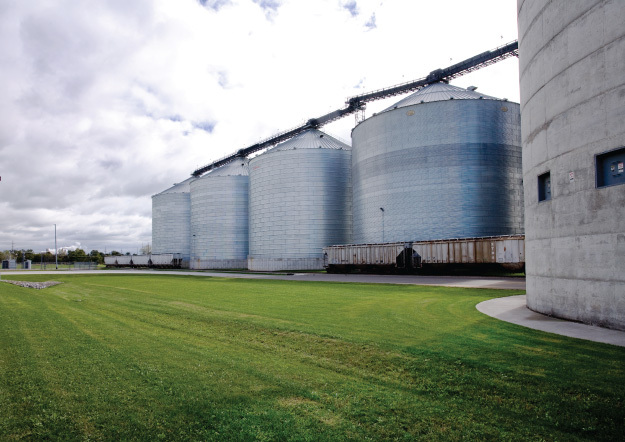 As a farmer, he appreciates what having a local ethanol plant has done for his operation. “It’s created more competition in the marketplace, and has raised our price of corn,” says Morse. When he puts on his board member cap, however, he has a message for his fellow corn growers.